I wanted to write a bit about my first experience overseas because for many people taking a sabbatical may be the first real exposure to new cultures, people and ways of doing things. It can be an unnerving experience at first. 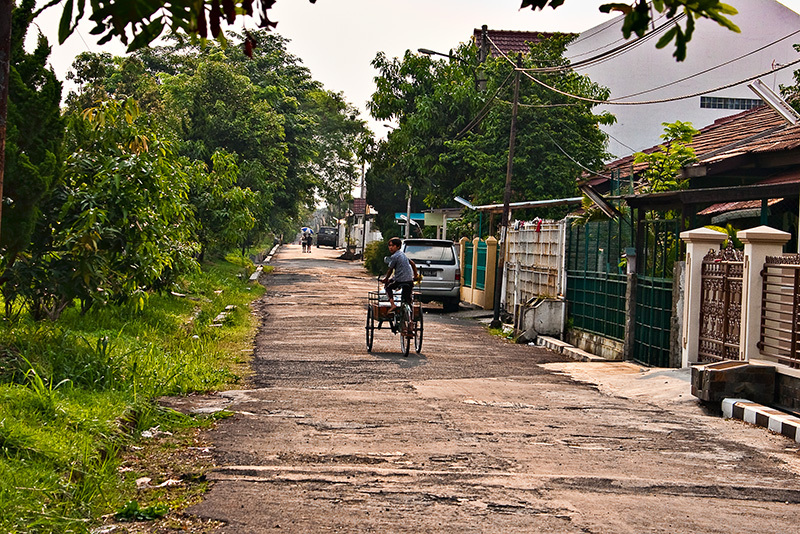 My first experience began the minute I stepped off that plane in Jakarta back in 2001. I distinctly remember the wave of hot humid air that hit me as I stepped off my flight. It was like opening the door of a furnace and having a blast of super heated air smack you in the face. My sweat glands kicked into overdrive and I soon felt hot and sticky. The heat has a way of sucking all the energy out of your body leaving you feeling like a wilted leaf. I had just arrived on a quick flight from Singapore having previously endured an 18 hour trans-oceanic journey from the US. I was here to meet my fianceé for the first time and get married. As I walked through the terminal with the rest of the passengers we all queued up in the customs arrival area. This was my first time outside of the US and I had no clue what to expect. It’s funny how when you are put into a situation that is unfamiliar our minds start playing around with the “what-if’s”. The line moved slowly. Very slowly. My fiancée had my flight arrival information and hopefully she was waiting for me but at this point it was almost an hour since I had landed. I hope she was there and still waiting. As I crept closer to the looming window of the customs agent I prepared my paperwork. Customs card? Check. Passport? Check. Finally it was my turn. I stepped forward and presented my passport. “What is your purpose in Indonesia?” the official asked. “Visiting friends.” I replied. I figured saying I was here to get married to a woman I had never met in person before might raise a few eyebrows so I kept it simple. “Enjoy your stay.” He said as he forcefully stamped my passport. Hooray!!! My very first stamp in my new passport book! And that was it. I was waved through and into the airport terminal. Now it was time to find my baggage and meet my girl for the first time. Finally I saw my luggage sitting all by itself off the carousel. I grabbed it and heading for the exit. As I approached a security guard waved me over. He saw my passport in my hand and after briefly looking it over motioned me completely around the x-ray machines that were busy scanning other passenger’s luggage. I started to lift my suitcase up on the conveyor belt as well but he grabbed them and carried them to the other side of the security check-point completely bypassing all security. OK, this was interesting. As I turned to speak with him he had already disappeared back to his post I presumed. So I grabbed my bags and proceeded out of the airport. But before I could make it outside I was confronted by a small kid who wasn’t much taller than my suitcase and probably a good 30 pounds lighter. “I can carry your suitcase for $20” he said. I looked at him and then back at my massive suitcase and then back at him. If I hadn’t been on a tight budget and in a hurry I might have splurged and spent $20 just to watch him wrestle my bags but I figured I was going to see plenty of good entertainment in the days ahead so I politely declined. But he was as persistent as a used car salesman and tried several times to lift my massive bag. When he couldn’t lift them he tried pulling them. I tried to be a bit more assertive and put his mind at ease that I was fully capable of managing my own bags, but he just wouldn’t take no for an answer. I had to applaud him for his tenacity which earned him $5 which was the only money I had in my pocket at that time. I’d later tell this story to my wife who was shocked that I had given $5 which apparently was a large sum of money. Live and learn. Yet another lesson for the naïve “green” traveler. Finally I emerged from the airport and proceeded down a walkway lined with people all waiting for loved ones to emerge from the terminal. It was like being in a parade with people waving and calling out. I kept scanning for someone who looked like the photos my fiancée had emailed me but I didn’t spot that familiar face. I was beginning to get worried that I would be all alone in this strange and intimidating country. Then as I neared the end of the parade I spotted her. It was like the clouds parted and a beam of sunlight shown down on her from the heavens. She was a welcome sight after almost 24 hours of travel. I have to admit that it is a surreal experience to meet a person online, fall in love, plan to get married, fly to the other end of the world, enter a totally unfamiliar environment and culture and meet this person face to face for the very first time. It would be impossible to accurately describe the feelings in words. So I’ll just leave it at “we had a great first meeting” and you can imagine what that must have been like. After loading my baggage into the car my fiancée had rented, our driver started the long trip from Jakarta to Bandung. 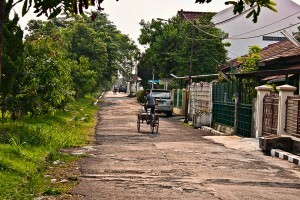 As we left the airport and headed toward Jakarta I had my first episode of real culture shock. As we drove away from the airport we slowed and as I looked out the window I saw an old crippled man lying in the middle of the road reaching out desperately to passing vehicles. His mangled leg was wrapped in tattered cloth that was stained with blood and his gnarled hands gripped a wooden cane. As we slowly drove by I looked into his eyes and for a moment the world stopped and then seemed to spin in slow motion. I’ll never forget that look of despair and hopelessness and the pleading look in his eyes, the expression on his face. Even today if I close my eyes and think about him I can clearly remember and picture everything about him. As we continued along I started to make out the skyscrapers of Jakarta through the thick smog. We were now traveling along a dirty trash lined river and on the opposite bank was a slum city. It was such a polarizing view to see these dilapidated slums juxtaposed with the backdrop of these shiny skyscrapers symbolizing success and prosperity. Two extremes in such close proximity to each other. It’s one thing to read about and view photos of extreme poverty but something completely different to experience it in person. It somehow becomes much more real. And to be quite honest I didn’t really “experience” it by simply driving by. But it did affect me in many ways. After several more hours of driving we finally made it to Bandung. I was so exhausted at this point that meeting my fiancées family was just a whirlwind experience. All I wanted at that point was sleep. And that was my introduction to the country that I ended up growing to love. I think that as travelers to unfamiliar lands we need to be aware that we will be presented and faced with things that are outside of our normal comfort zone. For myself personally seeing the extreme poverty was a very profound experience that really shaped the way I see the world today. How we react to these situations is going to really dictate the enjoyment we have in experiencing and learning about new cultures. It’s important to maintain an open mind, to not pass judgment and just spend time in the moment no matter how uncomfortable it might be. Embrace the experiences and realize that it is the differences that make this world unique and interesting and help shape our own perspetives and beliefs. Have you experienced episodes of culture shock? I’d love to hear your experiences and how you handled it. If you enjoyed this article be sure to sign up for the 1 Year Sabbatical newsletter over in the sidebar, as well as take a look at the RSS Feed. You have amazing stories. Culture shock for a normal person would be all of that NOT INCLUDING the meeting your fiance for the first time!! Bravo! Thanks so much! You have amazing stories as well. I’ve slowly been reading through your archives. 🙂 I’m a bit concerned with how my kids will react to all the new experiences. I want to believe that in the long run it will be an incredibly positive experience in their lives. Speaking of humid air. I grow up in Taiwan as a kid, I move to America with my family when I was 8 years old. When I turn 9 I went back Taiwan for a visit and I past out on the street market because of the HOT weather. (I was shock that I’m not use to the weather anymore –My grandparent had to carry me home). Anyways there wasn’t any culture shock for me beside the weather heehee. I agreed with you that we’ll be facing different type of comfort zone when you’re new in a place. Well written! Hi Sarah! I’ve always wanted to visit Taiwan. Closest we’ve been is the airport. 🙂 I spent a few years living in Virginia where the summers can get quite hot and humid but that was nothing compared to Indonesia. After two months I was starting to get used to it though. Based on your experience going back to Taiwan after a year it will be interesting to see how my wife feels about the heat having grown up there but now being away for 5 years. How often do you get back to visit Taiwan? So amazing how life brought you to Indonesia and your wife! It must have been the most unsettling and exciting time! Hi Mary! From what I know of myself it is indeed quite amazing that I would up and fly across the world to get married like that. And you are correct! It was the most exciting time of my entire life. I can’t wait to return and experience some more with my whole family. My first culture shock was also in SE Asia. I’m familiar with the heat hitting smacking you in the face. That’s what it felt like for me too when I stepped out of the airport in Bangkok. Asia was so culturally different from where I grew up, I didn’t talk much the first few days. But eventually I adjusted and felt better. It was such a great experience. Hi Steve! That intense humid heat will get you every time. I’m an introverted person so I tend to really hold back so adjusting to a new culture has always been a challenge for me. It sounds like after a bit of adjustment you had an incredible experience in Asia as well. How did you end up breaking the ice and just enjoying the culture? Good to hear from you. I knew Spain pretty well from holidays before moving here, but after a year or so I was getting culture shock on visits back to the UK. Everything seems to have calmed down now after a bit more time. The one place I have visited where I expected to be really culture shocked was Japan, but in fact it was a super smooth experience (for tourists anyway). Hi Steve! I guess I hadn’t given much thought to reverse culture shock where you spend so much time away from your home country that when you return it is the place that seems foreign. I remember Raam Dev writing a post about this. I think it was this one.